My friend Jenn has a Gluten sensitivity and she asked me if I would do a little research for her and locate a no fail Gluten Free Chocolate Cake. Being a girl that has a deep love for chocolate ANYTHING I responded…. “If I must”. So out into the recipe world I went and after three tries I have landed on what I think is the BEST Gluten Free cake to ever grace the planet. Transfer the batter to the prepared pan and bake until puffed and set, 35 to 40 minutes. Let cool in the pan for 1 hour (this is very important! DO NOT take out too soon). Run a knife around the edge of the cake before unmolding. Using an electric mixer, beat the remaining 1 cup of heavy cream with the sour cream and confectioners’ sugar until soft peaks form. 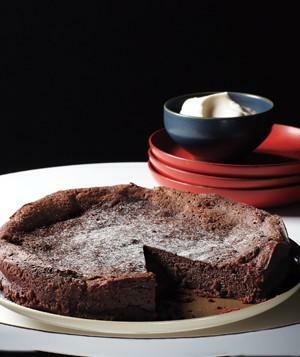 Dust the cake with confectioners’ sugar and serve with the whipped cream.